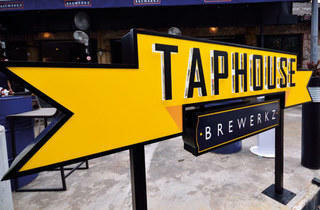 Note: Taphouse by Brewerkz is now closed. Characterised by a warm, organic-driven interior of exposed bricks and unfinished wood, as well as its sizeable outdoor seating area, local microbrewery pioneer Brewerkz’s latest Taphouse concept takes its unpretentious design cues from the growing legion of craft beer bars in the US. 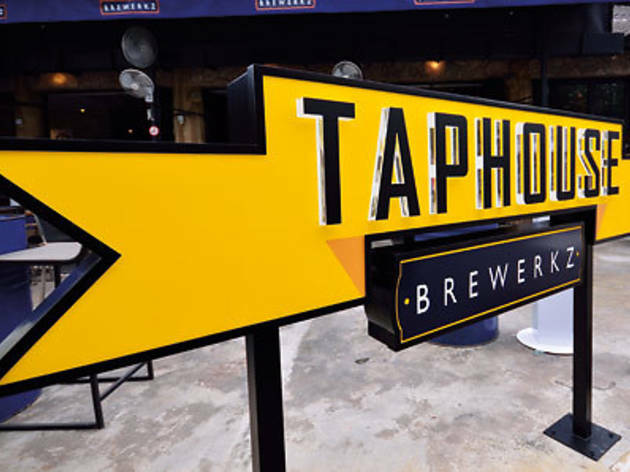 Beer-wise, Taphouse’s selection – chosen by founders Devin Otto Kimble and Daniel Flores – is definitely more for seasoned drinkers. Save for Brewerkz’s light, perennial favourites like its Golden Ale and Pilsner, brews like its mainstay India Pale Ale and seasonal Black Pig (all by head brewer Scott Robinson) are punchy pints, heavy in hop bitterness and malt body. The bothersome tiered pricing system – prices start at $6/pint from noon and nearly double during peak hours after 6pm – is carried over from Brewerkz’s Riverside and Indoor Stadium outlets, though it’s been slightly honed into three key periods of the day. Besides offering a range of ciders, and a staple of mixed drinks – Brewerkz’s bottle selection is expanded here as well, putting the spotlight on the brand’s exclusive imports from noted American breweries like Almanac and Widmer – the menu also offers bang-on-trend beer cocktails, like the Misty Morning Hops ($16), which plays on the sweet with its mixture of the ginger-driven Domaine de Canton liqueur, Brewerkz Golden Ale, Hendrick’s Gin and citrus. There’s certainly plenty here to make sure even your beer-averse pals can get tipsy. <pstyle="text-align: justify;">Food-wise, there’s nothing too complex: the one-page menu offers pizzas, burgers and a smattering of salads, most offered at the brand’s other branches – Brewerkz favourites like its super stacked King Brew burger ($29) makes an appearance here, with an optional extra of a Wagyu patty ($6 supplement). There are several new pizza options, thanks to the installation of a wood-fired oven (the same model used in the kitchen at Daniel Boulud’s local db Bistro Moderne) – we loved the Taphouse-exclusive Rustic pizza ($21), with house-made fennel sausages, red onions and Portobellos, and the Tiki pizza ($20), with substantial bites of meatballs and pineapples. There’s an ongoing promo offering two pizzas and a jug of beer for $60 (until Oct), which is perfect for two to three people. Any cause for worry that Brewerkz was moving towards a more high end concept with the Dempsey-area Taphouse (joining nearby Red Dot and Tawandang breweries, also on the hill) can be put to rest. The attentive and friendly servers ultimately round off Brewerkz’s vision of a chilled-out, approachable setting, delivering good beers at a good location. Beers from $6, mains from $14-$57.